Winnebago Mini Teardrop Features Exclusive Real Tree Decor. 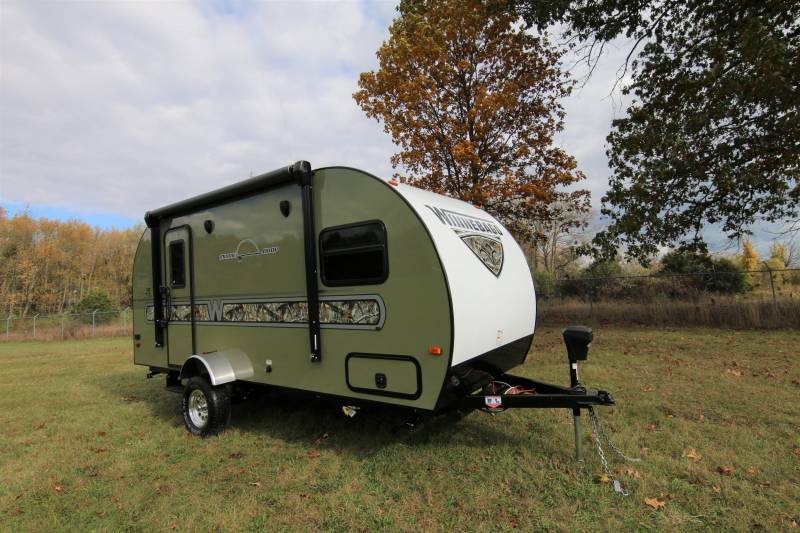 MIDDLEBURY, INDIANA, November 3, 2017 - Sure to appeal to outdoor sporting enthusiasts, Winnebago is now offering a special-edition Minnie Drop 1790 featuring exclusive Realtree exterior camouflage graphics. Winnebago’s special-edition unit is offered in the 1790 floorplan, which features a large dinette slide room, queen bed and spacious rear galley. A roomy yet, aerodynamic shape makes the Minnie Drop comfortable while providing visual appeal. Interior and exterior storage creates ample space to stow hunting and fishing gear, or whatever else is needed for your next adventure. “The option of an off road package includes lifted axle with 15 inch tires to make heading to remote areas an achievable goal,” said Gerber. The Realtree graphics package offered on a 1790 floorplan has an MSRP of $20,500. Winnebago Industries is a leading U.S. manufacturer of recreation vehicles under the Winnebago and Grand Design brands, which are used primarily in leisure travel and outdoor recreation activities. The Company builds quality motorhomes, travel trailers and fifth wheel products. Winnebago has multiple facilities in Iowa, Indiana, Oregon and Minnesota. The Company's common stock is listed on the New York and Chicago Stock Exchanges and traded under the symbol WGO. Options for the Company's common stock are traded on the Chicago Board Options Exchange. For access to Winnebago's investor relations material or to add your name to an automatic email list for Company news releases, visit http://investor.wgo.net. Realtree is the world's leading camouflage designer, marketer, and licensor with over 2,000 licensees utilizing the Realtree camouflage brand. Thousands of outdoor and lifestyle products are available in Realtree camouflage patterns. In addition, Realtree is committed to supporting individuals and groups that work to ensure our outdoor heritage, the conservation of natural places, and the wildlife that resides there. Realtree promotes its products and relationships widely on television, as well as through Realtree.com and many other outlets. 2018 Winnebago "Special-Edition" Minnie Drop 1790 featuring Realtree exterior camouflage graphics. Against the background all that camo makes it very hard to find.